Semi-transparent, medium tinting strength, PV 259, anorganic manufactured. Suitable for all binders and media, except plaster, cement and fresco. Q: Is this pigment non-toxic? 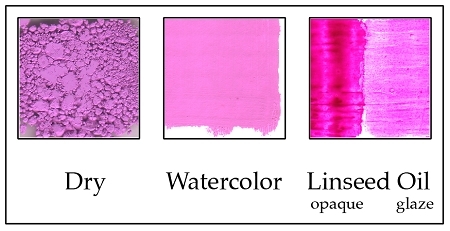 Q: What is the tinting strength and lightfastness of this pigment? A: Tinting strength would be rated a medium and the pigment is perfectly lightfast. Q: Is this a granulating pigment? A: Not sure what is meant by granulating. If you mean clumping, then it is a clumping pigment, if it is not dispersed properly. Q: Is there an ingredient list available for this or is it actually pure Ultramarine pigment? A: It is a pure Ultramarine pigment.